Home Fitness Are Tempo Runs the Key to a Personal Best Timing?? The obsession with running is really an obsession for achieving more and more with life ! Bottom line up front – The ability to run with sustained speed is the key to achieving a personal best time in a Half Marathon! Unfortunately endurance running is a not a sport of instant gratification. It demands sweat and perseverance…..not the slogging kinds….but a SMART (specific, measurable, achievable, relevant and time bound) training plan executed relentlessly. Speedwork / Intervals / Fartleks to improve speed and running form. Long Slow Distance (LSD) Runs to develop stamina and endurance. Strength, mobility and flexibility training for obvious reasons. Tempo Runs – where it all comes together to synergise into the ability to run with sustained speed over the distance. Confusing terms are being tossed about – tempos, threshold runs, lactate threshold, anaerobic threshold, etc, etc….…separates the wannabes from the in-crowd. This piece looks towards finding a method in this madness….clarify the basics and suggest a doable tempo training methodology. Aerobic Threshold. The aerobic threshold is the level at which an athlete can run without accumulating significant lactic acid in the blood, ie. the body clears the lactic acid being produced efficiently. The higher your aerobic threshold, the faster and longer you can run. More relevant to marathoners keen on avoiding/conquering the wall. Lactate Threshold. As you run faster and faster, your body uses less of your aerobic system and produces more lactic acid. The lactate threshold is the point at which lactic acid is just beginning to accumulate. Workouts that increase the lactate threshold are run at 71%-75% of maximum heart rate. To put it more simply this pace usually corresponds to your half marathon race pace. Most runners can hold their lactate threshold pace for 20-40 minutes in training, depending on how fit they are and the exact pace they are running. Anaerobic Threshold. The anaerobic threshold is the exercise intensity at which lactic acid accumulates in the blood stream significantly faster than it can be cleared away. This creates a burning sensation in the legs, telling an athlete that they are running right on the edge of their anaerobic threshold. Anaerobic threshold runs are run at a pace that you can maintain for about 60 minutes, and are sustained for approximately 20-40 minutes. The essence of the above is that these thresholds are different levels on the lactate curve. All that is ok, but what really do I need to do? Simple…an amateur half marathoner must raise his lactate and anaerobic threshold levels to improve his overall timings ! The suggested training methodology. Run at your 10 k pace or the pace you can hold for one hour. Commence with an easy jog of 1 km to warmup. Accelerate to your 10 k pace and sustain it for 40 mins. Alternatively you could do tempo intervals. Alternating 2k tempo pace with 1k slow pace for 50 min to 1hr. Slow jog of 1k to cool down. Lactate Threshold/Tempo Runs. Longer endurance workouts or easy speed workouts help to build your lactate threshold. Run at your current half-marathon pace or slightly faster. 2 x 5 Kms @ half-marathon pace with 3-5 minutes rest between each. Or you can create a ladder of 3 km, rest, 5 km rest, 3 km. Caution. While you can create variations of the above to suit your individual requirements, the key component of tempo training is running at the correct pace. Moreover, excessive distances may result in longer recovery time….negating the benefits. It is also recommended that amateur runners and first timers don’t do more than one or at the most two tempo runs a week. Get the tempo training right and you will see significant improvement in timings ! Thanks for the positive and knowledgeable suggestions. 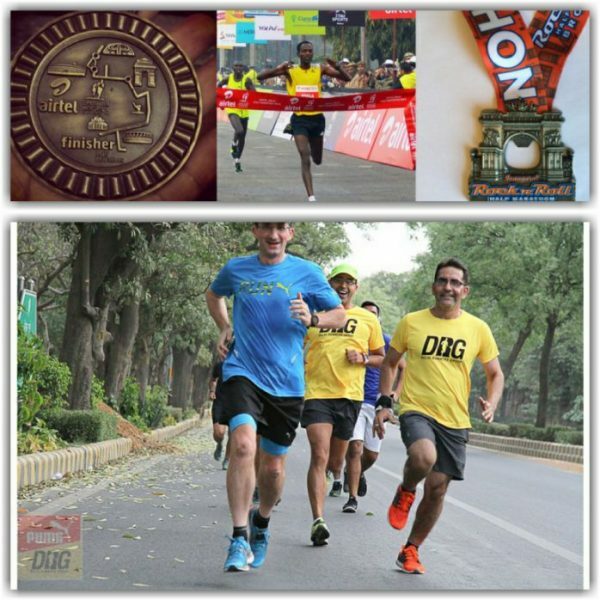 It is heartening to know that a blog for new runners is being read with interest by informed runners. The literature on threshold or tempo training and heart rate based training is not definitive. Large number of studies justify varying hypothesis. Hence, the focus was to just provide enough information for the new runner and lead him onto the suggested training runs! Formatting suggestions duly noted. Thanks for the feedback! Happy Feet.